Chronic inflammation is a major health issue that can lead to serious health disorders such as diabetes, cancer, rheumatoid arthritis, heart disease and dementia amongst others. A common cause of this chronic inflammation begins with inflammation in the gut caused by foods which have not been properly digested, by allergens and by parasites in the gut which have not been removed by the body’s defence systems. This can lead to auto-immunity and disruption of the immune system. Stress and ageing are also factors which increase the likelihood of inflammation in our bodies. To counter this, it is important to have good digestion and to consume foods containing anti-oxidants, which reduce inflammatory cytokines thus resolving the inflammation. Salmon, kale, blueberries, raspberries, capsicum, almond, quinoa, chia seeds, sesame seeds, fermented soy products like tempe and miso, herbs including turmeric, ginger, green tea and rosemary. The food with some of the most amazing health benefits is turmeric. TURMERIC has been renowned as a wonder herb for centuries in India, Indonesia and China, and has been used to heal a myriad of ailments. It has a number of medicinal properties, including being an anti-oxidant, anti-inflammatory and anti-depressant. It protects us from arthritis, arteriosclerosis and heart disease. It has also been implicated in lowering the risk of cancer and dementia. Curcumin, and related curcuminoids, which are the active components of turmeric, has anti-bacterial, anti-viral and anti-fungal properties. Recent studies are supporting the long-standing Ayurvedic and Chinese treatments using turmeric, and are showing that turmeric may be in fact more effective than many prescribed drugs. Curcumin has been found to be as effective as potent drugs like hydrocortisone and phenylbutazone, but unlike these drugs, turmeric poses no toxicity and has no side-effects. It is effective in ulcerative colitis and other digestive disorders as well as in hayfever. Research has shown that anti-depressant medications can actually make depression worse. Curcumin raises serotonin and dopamine levels. The neurotransmitter serotonin has a role in mood regulation, sleep, learning and memory. Dopamine is involved in the regulation of mood and satisfaction, memory and sleep and is released in response to pleasurable experiences. Turmeric has not been trialled for major depressive disorders so cannot be recommended as a substitute for prescribed medication in these cases. Turmeric however is a beneficial supplement in cases of stress and anxiety where inflammatory states are affecting brain function. Turmeric also has anti-oxidant properties and lowers cholesterol levels. It does this by reducing cholesterol peroxides, which are the damaging form of cholesterol, in the blood vessel wall. It is a useful supplement for preventing blood clots in those at high risk of heart attacks. Its anti-platelet and prostaglandin modulating effects are similar to aspirin. 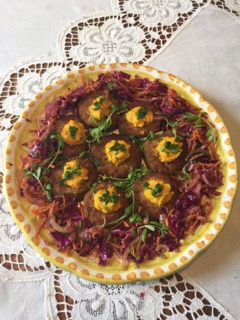 Turmeric may be incorporated into recipes for patties, vegetable pancakes and slices, stir-fries, soups, sauces and health drinks, to name but a few. 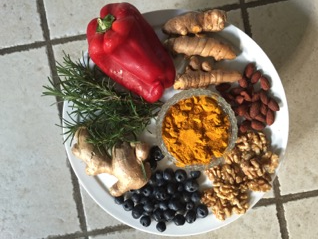 Here is a recipe featuring turmeric, which is also gluten-free, dairy-free and grain-free. Serve a dollop over each patty. ENJOY and keep watching for more ways you can enjoy turmeric!